Prior to Sunday night's game 7, I lamented the lack of in-game drama in this year's NBA finals. The average excitement index of those six games was 4.77, which at the time was the lowest average for the finals in the past 10 years. Game 7, however, delivered on the hype, registering an excitement index of 8.6, and bringing the series average up to 5.32. While 8.6 is well above the typical figure for an NBA game, it ranked 185th out of 1,316 NBA games this season, and was just the 13th most "exciting" game of these playoffs. But that doesn't feel quite right. There is a type of "excitement" that isn't necessarily captured by the excitement index. A game with a high excitement index is like a wild roller coaster ride, with numerous ups and downs, as each team's fortunes rise and then reverse several times. Game seven was not that type of ride. Notice how little the win probability line deviates from the 50/50 line, as if held in place by rubber bands. The most space the Warriors were able to create for themselves was over a four minute stretch that spanned the end of the first half and the beginning of the second. But the Cavs closed in the third quarter, turning a seven point deficit into a seven point lead. And then the game's rubber band AI kicked in again, and the Warriors regained the lead, taking a shaky one point advantage into the final quarter. With 5:37 left in the game, the Warriors peaked. 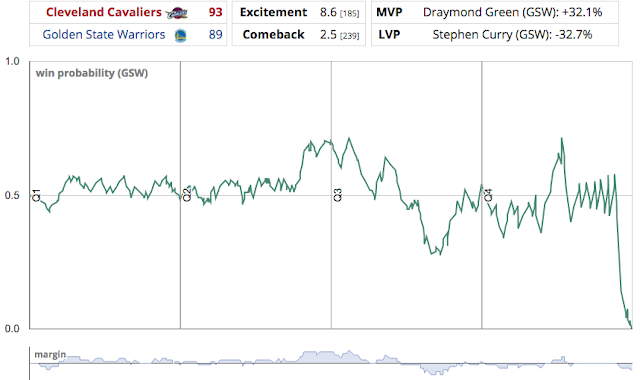 Draymond Green's putback gave Golden State a 4 point lead and a 71.6% win probability. Six points from Lebron and a terrible, no good, horrible, very bad behind the back pass from Curry later, the Cavaliers had a two point lead and a 60.1% chance of winning the title. After Klay Thompson scored what turned out to be the Warriors' final points (with 4:39 left!) to tie the game, what followed was the most exciting four minutes of scoreless basketball the league has ever seen. Note how the win probability graph proceeds in sawtooth fashion over that period, swinging above and below the 50% waterline. 12 possessions went by without a single point being scored. And then Kyrie Irving hits the go ahead three with 0:53 left, and the win probability graph collapses, as if unable to bear the weight of what had been building up over the prior four minutes of offensive futility. Is there a way to quantify that tension, put a number on it, and thus give it some historical context? The excitement index measures how far the win probability graph travels over the course of the game. What if we calculated a "tension index", which instead measured how closely the win probability graph kept to 50/50? If a "high excitement" game is like a roller coaster, then a "high tension" game is like walking a tightrope, maintaining a precarious balance atop a 50/50 tension wire for as long as possible. The "tension index" for game seven was 7.9%. This means that, on average, the win probability was 7.9% away from 50% (in either direction). To put that in context, the tension index for an average game is 22.1%. Note that a lower index indicates a more "tense" game. A maximally boring game would be one with a tension index of 50%, implying the win probability immediately shifting to a single team and staying there for the course of the game. At 7.9%, game seven of the 2016 NBA Finals was the most "tense" finals game of the past 10 years. It was the 2nd most tense game of the playoffs (out of 838 games), bested only by a recent first round classic: game 7 of the 2015 Spurs-Clippers series (tension index: 7.2%). And, out of 12,893 regular season and playoff games over the past ten seasons, last night's game ranks 22nd in terms of tension index (that's in the top 0.2%). The most tense game of the past ten years? An otherwise inconsequential game between the Lakers and Magic this past November, with an average tension index of 6.1%. The Tension Index has been added to the Top Games Finder. You can use it to find the most tense games of the 2014-15 season. Or perhaps the most tension-filled games played by the Indiana Pacers over the past ten years.